After Wednesday’s dual attack on Iran’s parliament building and the mausoleum of Ayatollah Khomeini that killed 12 and wounded 42—for which ISIS has claimed responsibility—Iran’s revolutionary guard released a statement casting blame on Saudi Arabia and America in the wake of Trump’s visit to the Middle East. “The public opinion of the world, especially Iran, recognizes this terrorist attack — which took place a week after a joint meeting of the U.S. president and the head of one of the region’s backward governments, which constantly supports fundamentalist terrorists — as very significant,” clearly referring to Saudi Arabia. The statement also acknowledged the Islamic State’s claim of responsibility. Now, it’s never wise to blindly trust something coming from the Iranian government’s propaganda chambers, but this particular claim is not, on its face, without merit. In two recent articles, I’ve looked at a situation that doesn’t appear related, at first glance, but may give an indication as to Saudi Arabia’s current mindset. That situation is Qatar, which has recently been diplomatically and practically isolated by Saudi Arabia and four other nations for allegedly “supporting terrorism.” That flimsy excuse hides the truth, which is that Qatar is one of the few Arab nations with ties to Iran—albeit very light ones—and has grown in regional influence via the support of Islamist groups like the Muslim Brotherhood, as well as the emergence of the state-funded Al-Jazeera as a powerful media network. With Trump’s tacit permission—which, incidentally, is likely viewed with frustration by his own government and military, seeing as how the U.S. has a friendly relationship with Qatar that includes a strategically important air base in the country—Saudi Arabia and its affiliates leveled the most punishing boycott of Qatar yet, including a travel ban. None of which is to say that Qatar is blameless. Like Saudi Arabia, they fund money to groups that are considered terrorist organizations, and their human rights record is atrocious. All the same, this was clearly a retaliation for different matters, and by not actively objecting, Trump gave the silent go-ahead. Now, what does any of this have to do with Iran? That’s where things get muddy. Officially, Saudi Arabia is opposed to ISIS, and ISIS hates Saudi Arabia. There have been ISIS attacks in Saudi Arabia, and Saudi Arabia has funded militias specifically opposed to ISIS. Now, there is an enormous leap between pointing out this relationship, and accusing the Saudis of directly coordinating with ISIS in an attack against Iran. And it’s a leap I’m not willing to take. 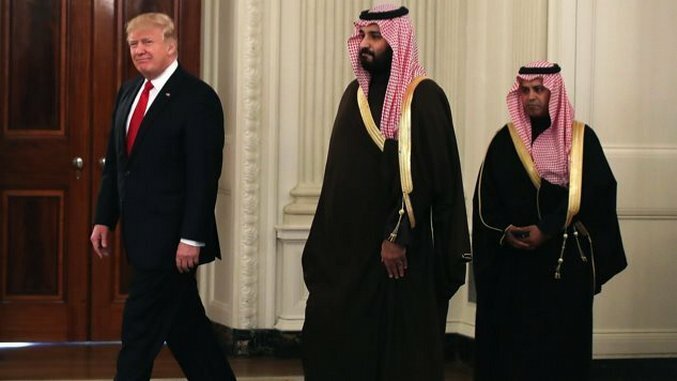 However, if it’s true that Saudi Arabia no longer feels restrained by America after Trump’s visit, and has a mandate to aggressively pursue whatever agenda they desire, that reality will not escape a group like ISIS. Would it embolden them, knowing that the proxy war between Iran and Saudi Arabia is about to heat up, to launch an attack on Iranian soil for the first time ever? It’s more than just a long shot. And Iran’s Revolutionary Guard, in mentioning both Saudi Arabia and Trump in conjunction with the deadly attack in Teheran, were not speaking idly. There’s a connection here, of some sort, and even in the complex geopolitical world of the Middle East, it’s only a matter of time before the battle lines become more explicit.